Where did all my money go? 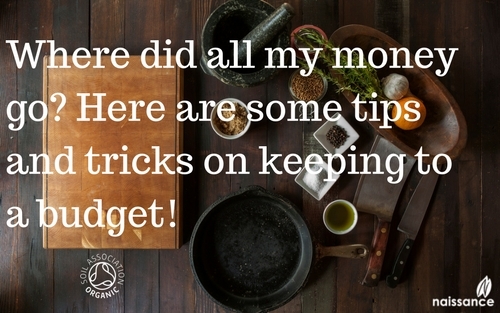 Here are some tips and tricks on keeping to a budget! Have you ever thought about going organic? Maybe you’ve made it to the supermarket or sat with your cup of tea in front of the computer ready to make those purchases. And then you see the price… take a small gulp. Maybe I’ll check another shop, to see if they are a bit cheaper?! It can be daunting and off putting. Here are a few simple ideas that we've used to help us keep to our budget, eat healthier, be good to the environment and be an ethical shopper. Make your own and stay natural, frugal and creative. By combing organic oils, waxes and many other natural products and even foods from your cupboard you can make everything from face masks and exfoliators to hair treatments and herbal baths - like these lovely bloggers and vloggers. Husnara is using our products to make a strawberry infused facial serum. She uses Jojoba, Frankincense, Lavender and Strawberry Seed oil. Cat uses Castor Oil, Vitamin E and Coconut oil to help her eyebrows grow faster and thicker. If you haven’t tried it, it really is fun. You could even do it while watching a film or listening to music, and it’s something you can do on your own, with the family, friends or under the watchful eye of the dog/cat/goldfish. Just look on YouTube to see how many people are getting into beauty hacking, crafting and making. There’s a whole community out there just waiting for you to join in. There’s no denying that bag for bag, pot for pot, organic and ethical products are generally more expensive than the alternative. However, you can keep to your budget and still buy better products by changing what you buy and by being organised. There are lots of us who enjoy making a meal plan for the week. It stops the worry of what to cook every day, you only need to do one shop and it should save you time and money, stop waste and help you eat healthier. Jack Monroe has a great blog and books on how to eat healthier for less. If nasty chemicals worry you, always wash your fruit and vegetables. You don’t need fancy cleaners to do this. Just water from the tap, and maybe a scrubbing brush for harder skinned products. This is important for organic and non-organic products, even fruit and veg from your own garden should be washed. This gets rid of lots of the nasties that might be having a party on our food – sorry nasties! Do you remember the time you bought that pot of crème fraiche because the recipe stipulated a tablespoon, and the rest of it sat in the back of the fridge until you found it, hidden behind the chutney, covered in mould? When all along it could have been somebody, something, well, actually it was on its way to being somebody. Perhaps you *should *just leave it there and see what it turns into – the well moisturised mould monster. By pre-planning our meals, we can plan for that extra crème fraiche and do something with it, stopping us wasting food and saving us money. According to Love Food Hate Waste we throw away 7 million tonnes of food, which collectively costs us £12.5 billion every year. There are lots of great tips on the website if you want to waste less and save money. Equally, if you are trying a new natural oil for the first time why not try a smaller bottle. See if it suits you and then get a bigger one if you like it, and if you really like it, why not buy an even bigger bottle. This will save on packaging and is often the cheapest way to buy your oils. You can get an organic veg box delivered from £10. There are also community supported agriculture (CSA) schemes where people in your local area work together to grow produce, some of them will be volunteers. By buying local you can cut down on your carbon footprint and support local. It may even be something you would like to get involved with yourself? Is it worth the money and the effort? The food that we put in our bodies and the beauty products we put on our skin all have an effect on our physical and mental well-being. Being healthy is one of the most important things in life, without it we find it much harder to have a good time and do what we want to do. Equally the way that natural products are produced and the effect that has on the environment should be an important consideration if we value the future of humanity on Earth. By using the methods above and thinking more about what we’re buying and the effect that has, we can all make changes to improve our health and that of the planet. If you have any tips, tricks or advice on helping us live a more ethical, environmental and healthier life, let us know in the comments below.